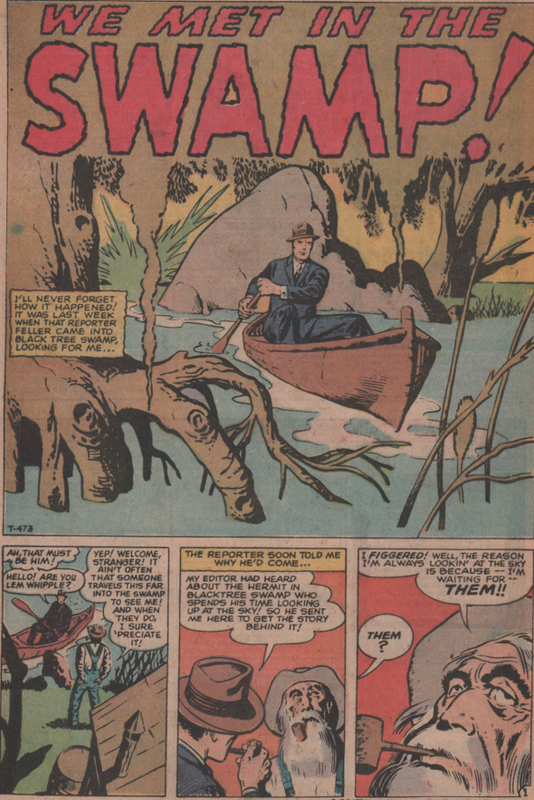 Comic Books | Magazines and Monsters! “Ridin’ that train, high on cocaine, Casey Jones you better watch your speed,” The Grateful Dead famously said in a song. 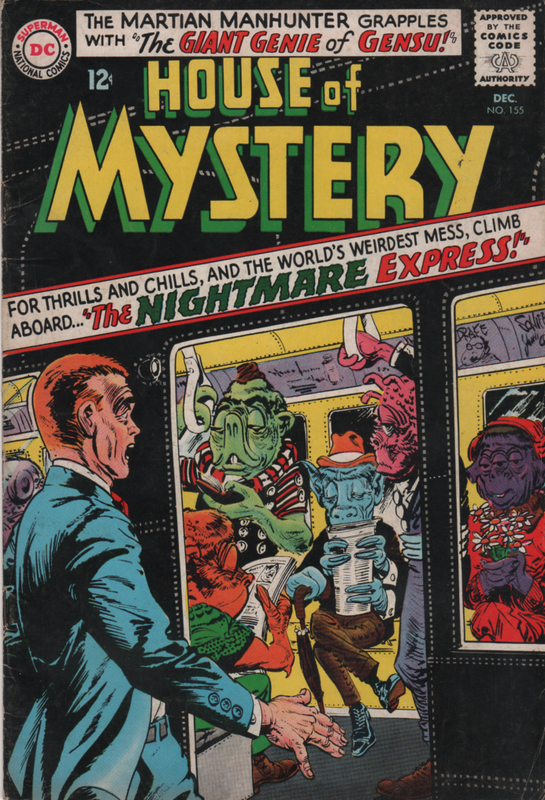 Maybe they were talking about the Nightmare Express? If so, drugs might be a good scapegoat for this one (just kidding). Anyway, there are three cool stories in this one and all of them are completely crazy. Translation- it’s an a awesome book! 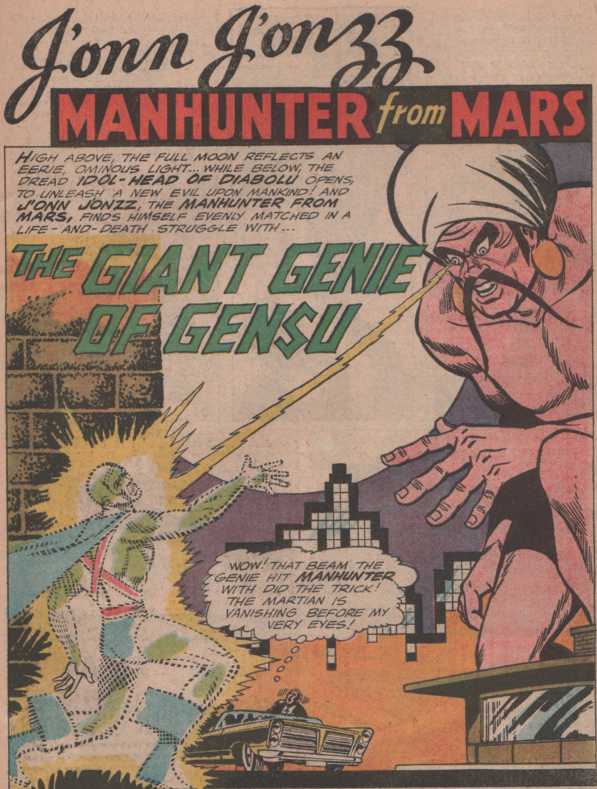 The first story is about J’onn J’onzz, the Manhunter from Mars! Now don’t get too excited, as he’s fighting the “Giant Genie of Gensu”…yeah. 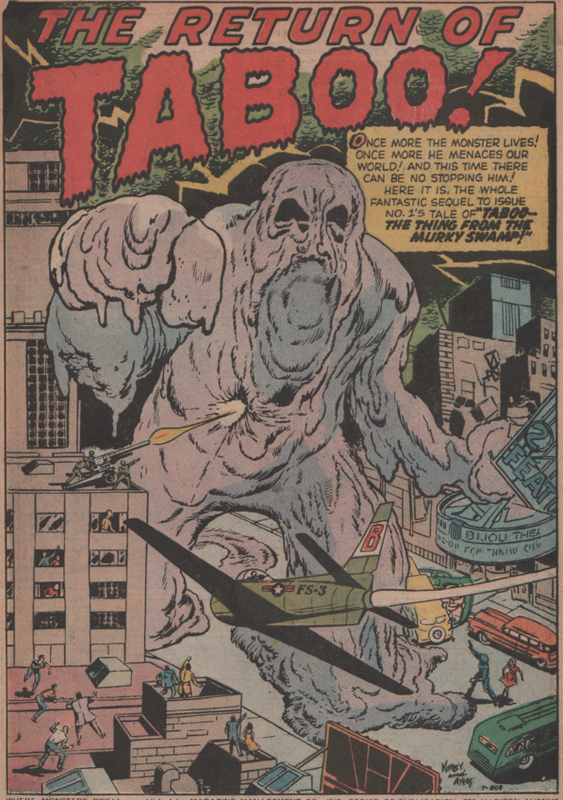 So that story isn’t the greatest, but it has really cool artwork with some hilarious shenanigans (Jack Schiff, writer, art by Sheldon Moldoff, letters by Ira Schnapp). 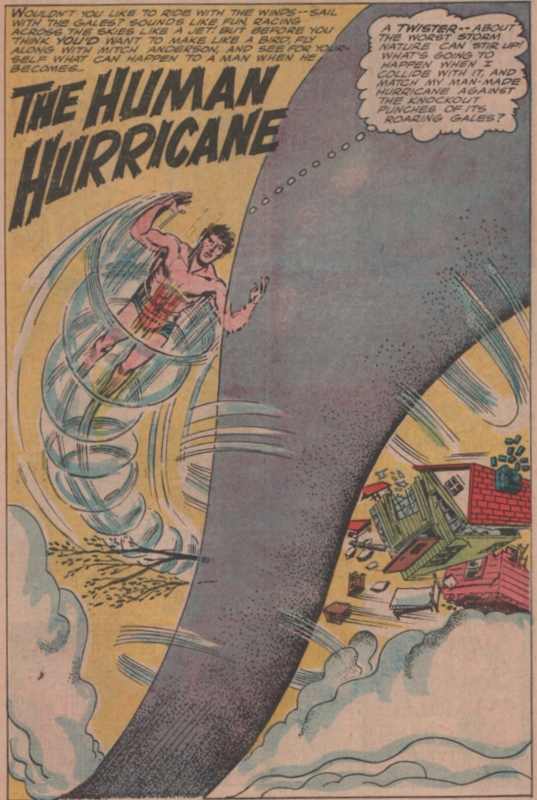 Next up is a tale called “The Human Hurricane!” Mitch Anderson is a guinea pig for scientist and ends up becoming, you guessed it, a human hurricane (story by Jack Miller, art by Joe Certa, and letters by Stan Starkman). Lastly, we climb aboard “The Midnight Express!” But don’t expect to see John Hurt or Randy Quaid, as this one has Detective John Sutter, on his way home from work, and he gets a ride on a train that he’ll never forget. 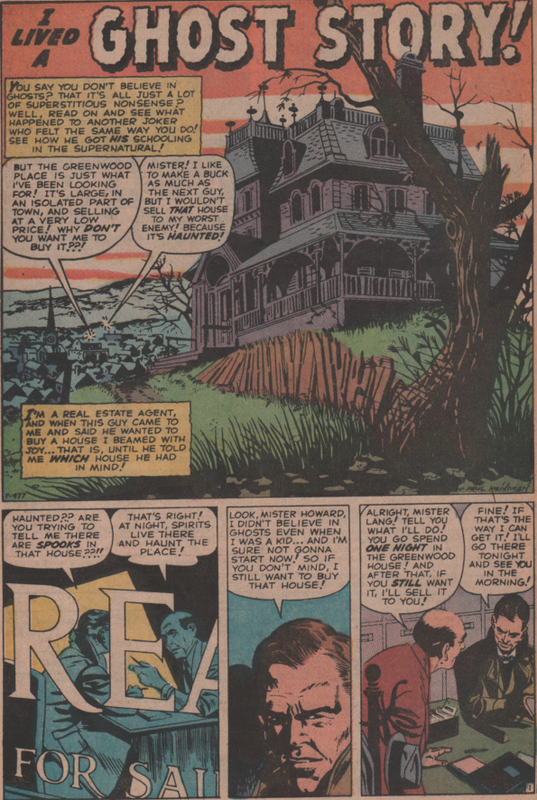 Or was it even real (written by Jack Miller, art by Bernard Baily, letters by Stan Starkman). This very groovy cover is by Jack Sparling! On this April Fool’s Day, there is no joking around here! My all time favorite artist is Gene “The Dean” Colan, so it’s a special occasion when I get a book with his work in it! 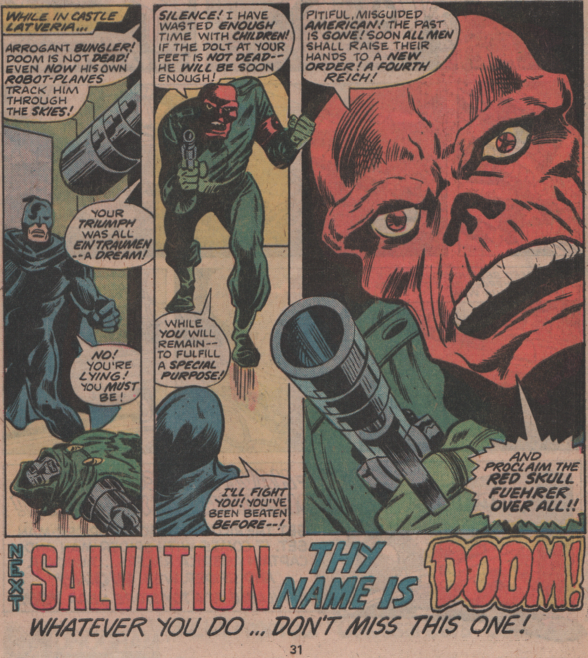 Most think of Gene when they hear Tomb of Dracula, and rightly so, but his work on superheroes like Captain America and Iron Man was special, too. 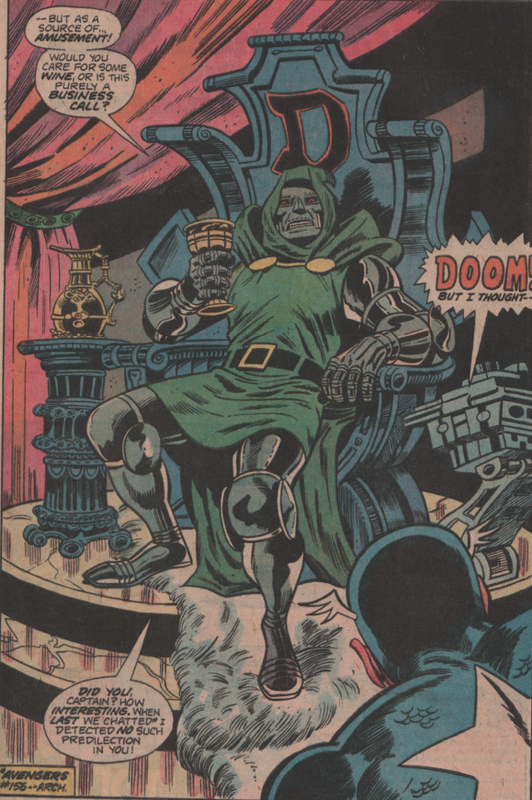 Most also probably think of Kirby when the subject of machinery and technology are discussed, but when Gene drew these types of images in Iron Man, he was excellent at it. In this issue, it’s up to Tony Stark A.K.A. 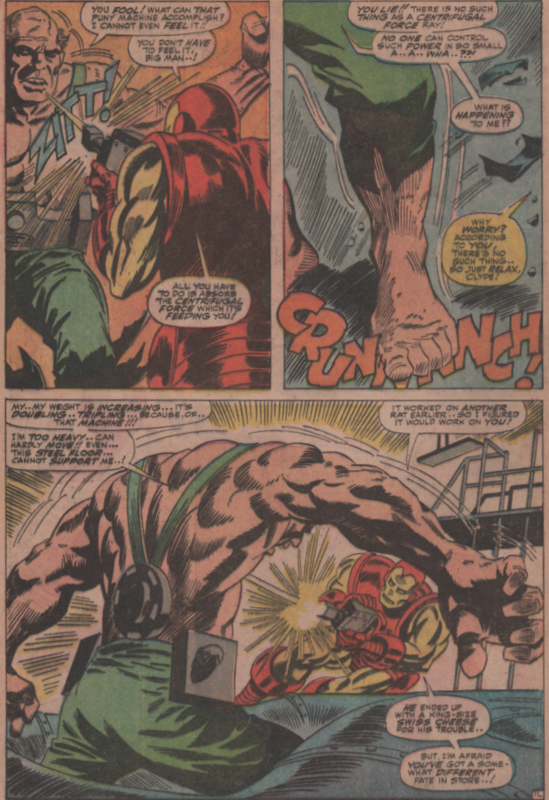 Iron Man, to stop some Cuban Commies and their newest weapon, The Crusher. A pumped up, nigh invulnerable guy that’s ready to take down the Golden Avenger! 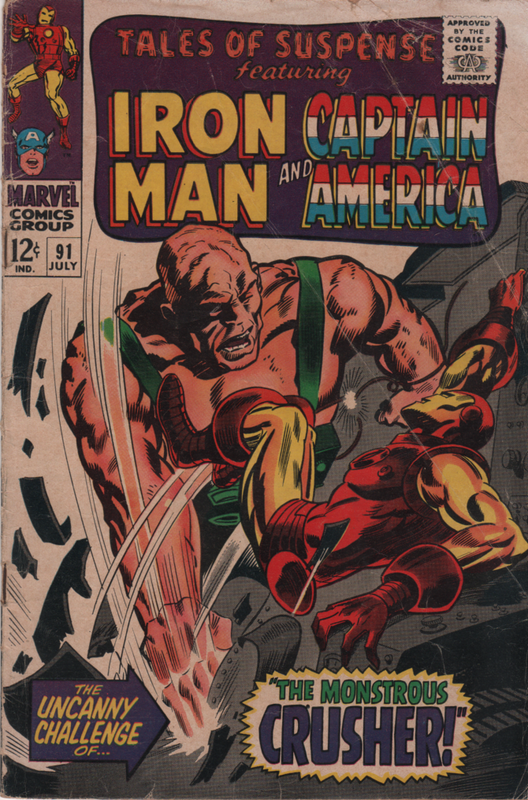 Can Iron man take down this make-shift Frankenstein Monster? 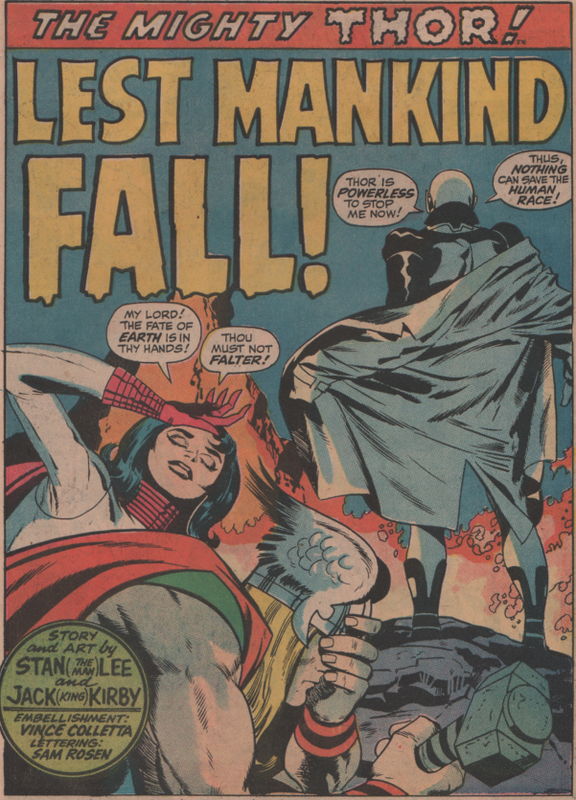 Written by Stan Lee, pencils by “Genial” Gene Colan (cover as well) inks by Frank Giacoia (cover as well), and letters by Sam Rosen! 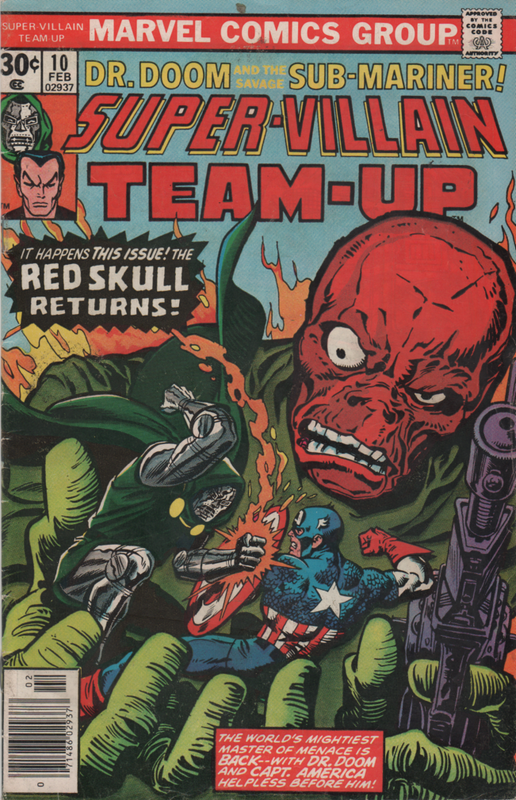 The second tale in this book is one that features Captain America, and his old foe, The Red Skull! 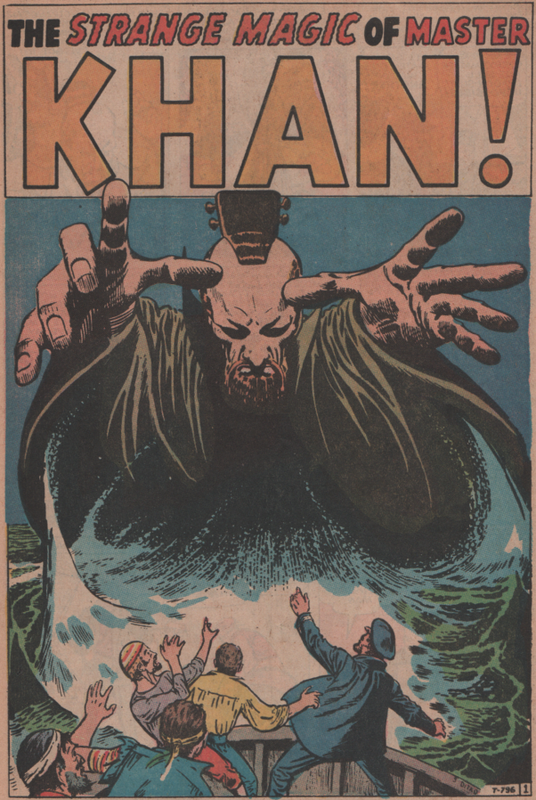 This trippy tale is by Lee (story), Gil Kane (pencils), Joe Sinnott (inks), and AL Kurzrok (letters). 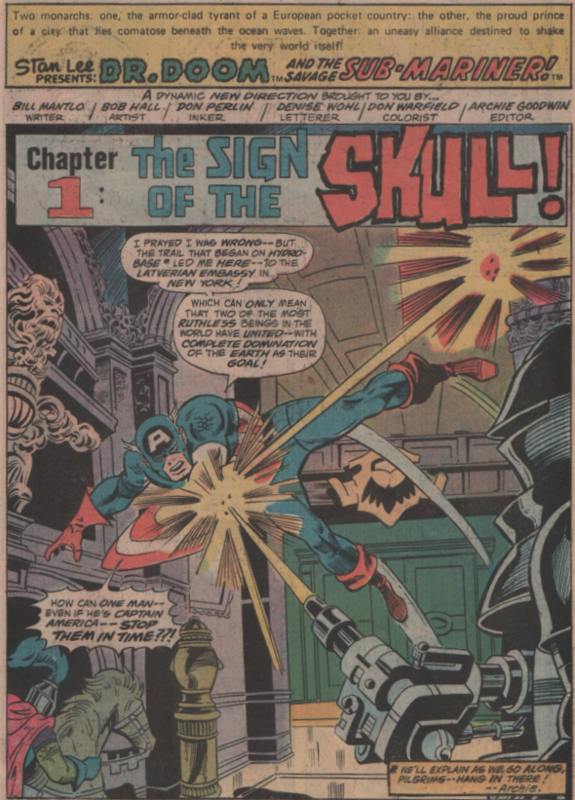 The Bronze Age will always be a huge focus for this blog, but honestly, the late Silver Age is when Marvel comics really started to turn the corner and become not only an innovator, but also super cool. The words trippy and groovy come to mind immediately when you look at their books from this period. 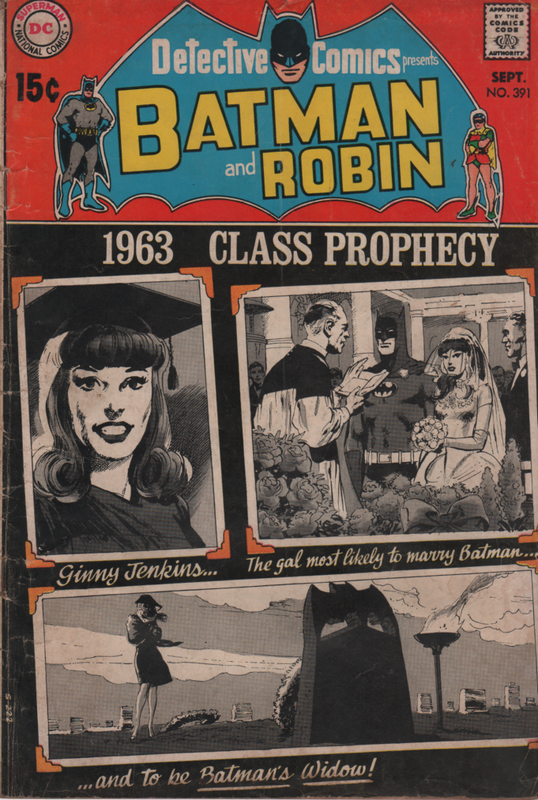 The majority of their characters were in place, and the comic book revolution was in full swing by 1969! 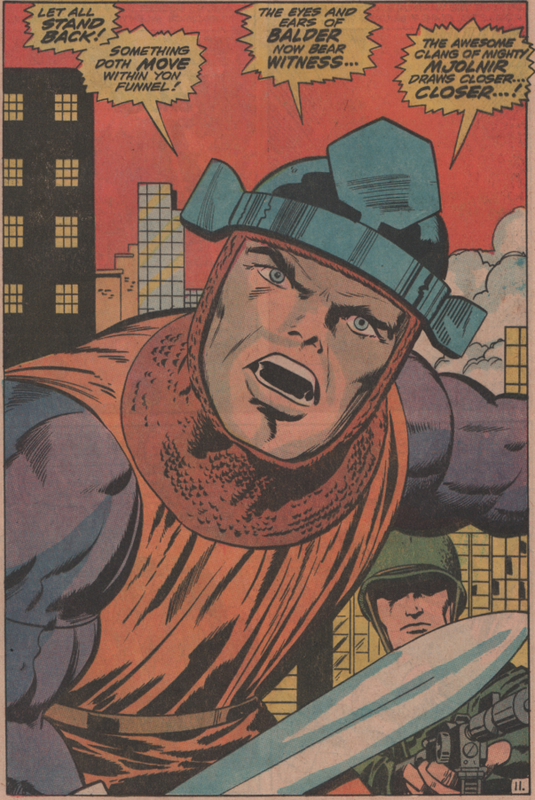 This was also a sad time for Marvel, as Jack “King” Kirby was just about to leave the company for greener pastures over at DC comics. He’d have the freedom to write, pencil, and edit his books there, and who wouldn’t be excited about that (plus get paid more as well). 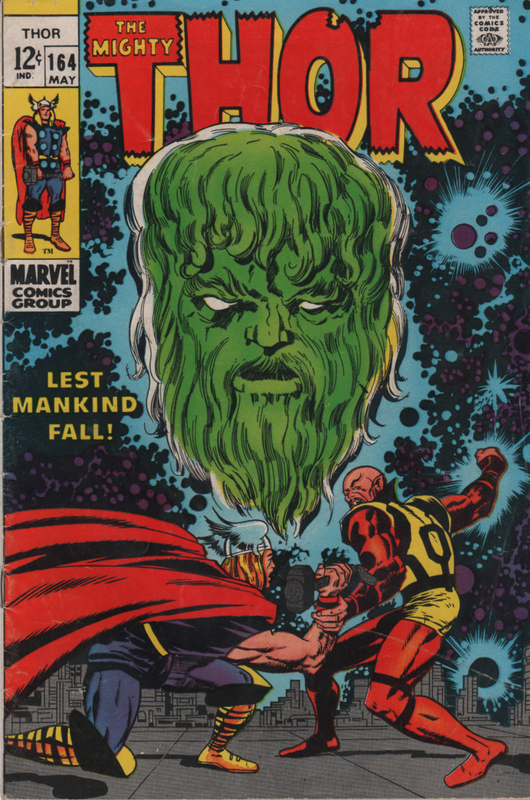 The mighty Thor was taken to new heights by Kirby recently, as he’s been to space and met the force of nature known as Galactus, and the malevolent Ego the Living Planet! 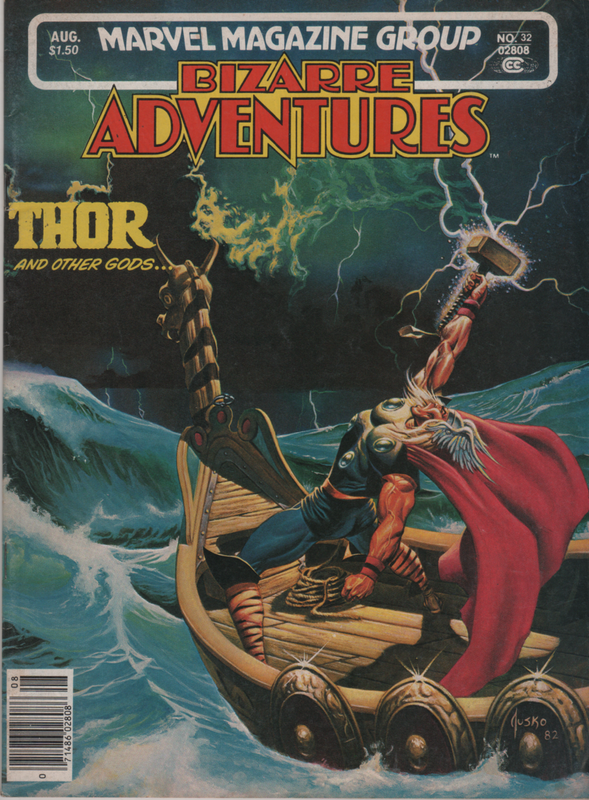 In this issue we get a huge battle between Thor and Sif and Pluto and his hordes of the underworld! 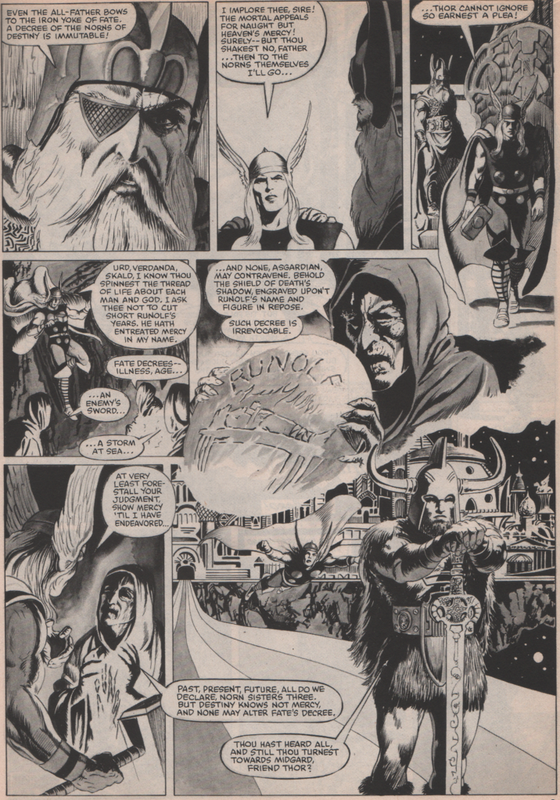 Fear not, as we’ll also see Balder the Brave, Thor, and even Zeus himself! This book is action packed, and really shows the scope of the Marvel universe as it pertains to the realms of the gods! 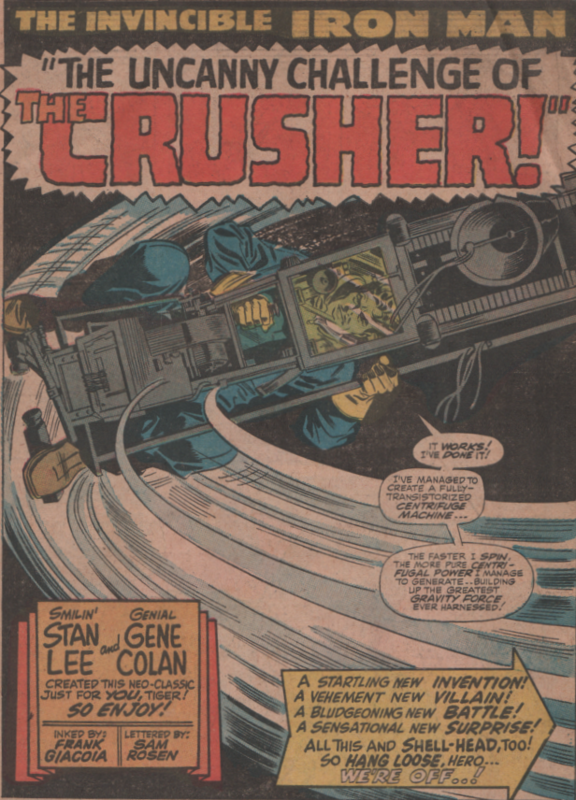 Written by Stan Lee, art by Jack “King” Kirby (pencils) and Vince Colletta (inks), and letters by Sam Rosen! 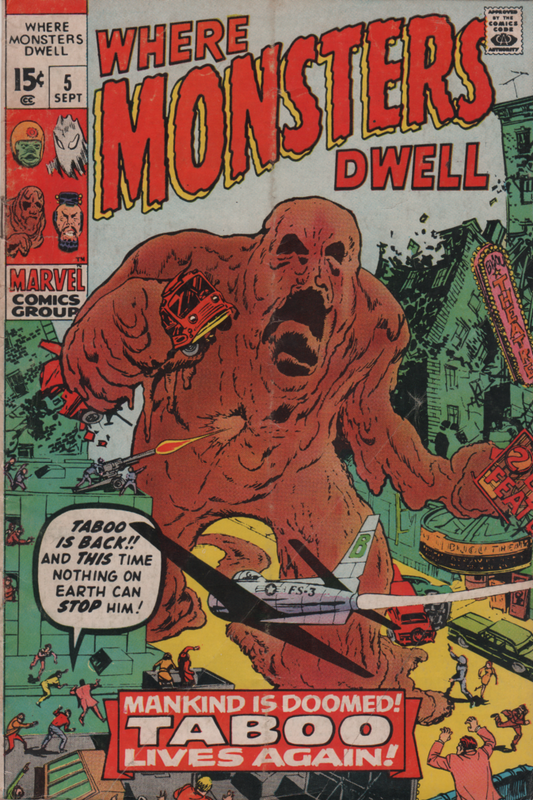 The magnificent cover is also by Jack Kirby and Vince Coletta (with colors possibly by Marie Severin)! 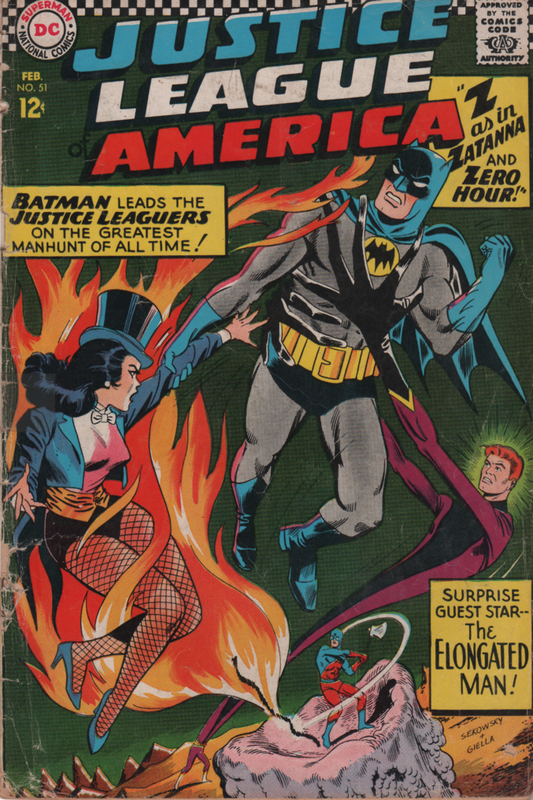 The never-ending search for more awesome comics from the Bronze and Silver Ages continues! 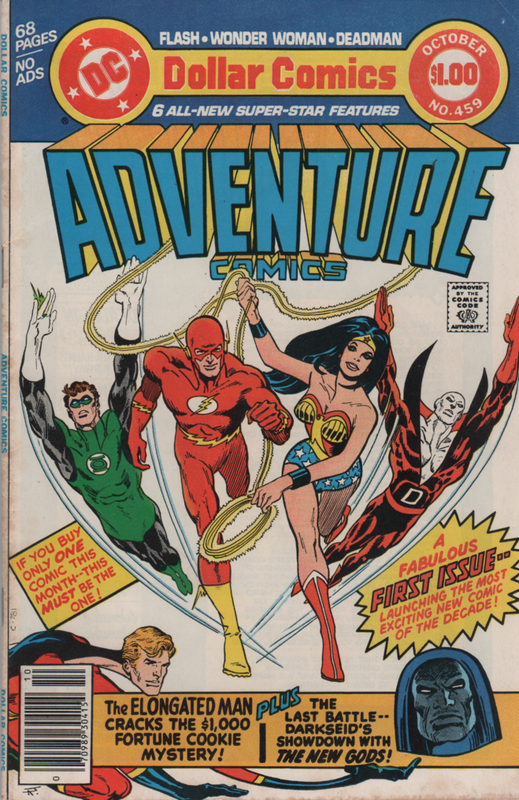 With a bigger focus on DC for now, let us focus on this issue of Adventure Comics! 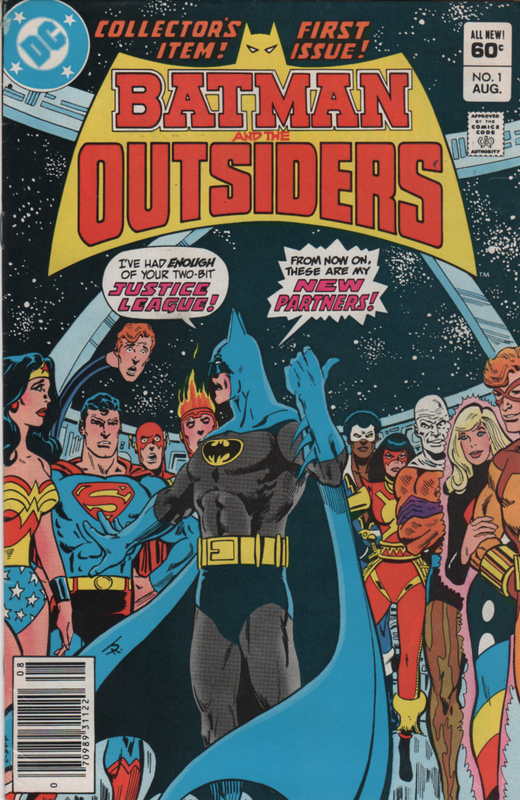 With sixty-eight big pages and no ads, features six stories with the likes of the Justice League, Elongated Man, and the New Gods! 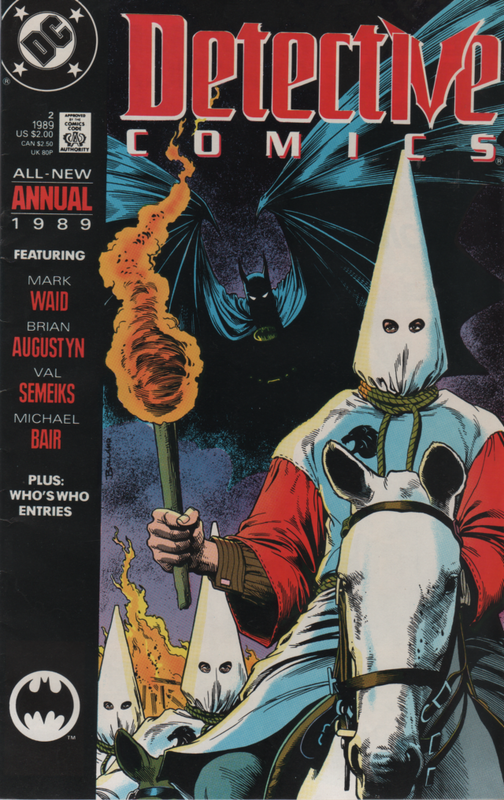 This book is a recent acquisition, but has already climbed the ladder to one of my favorite DC comics. 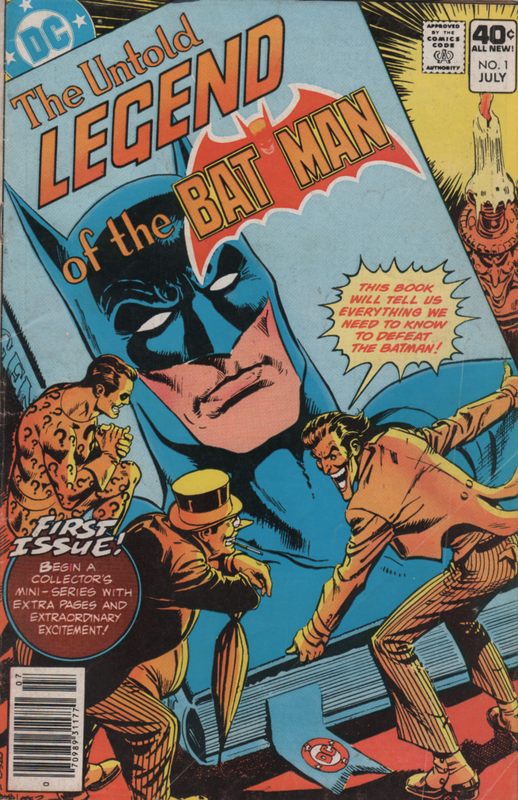 The cool cover is by DC stalwart, Jim Aparo! 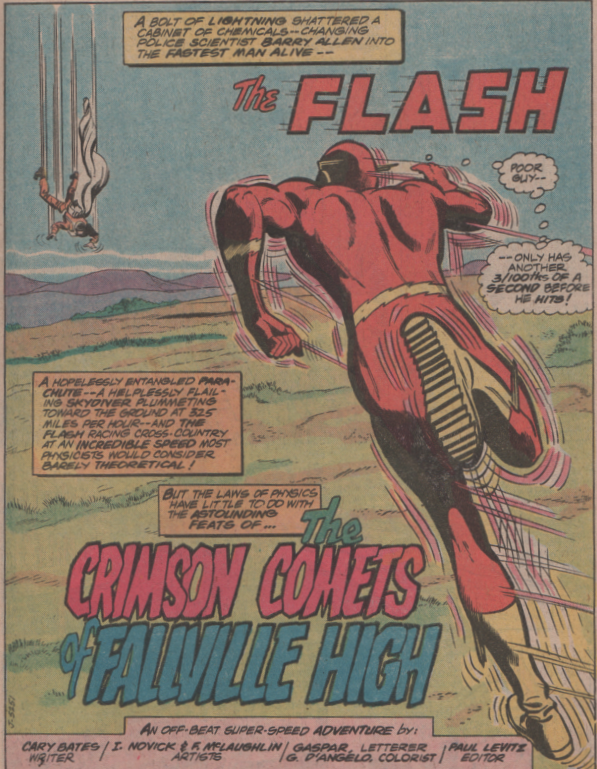 The first story features The Flash, and the name alone is incredible…”The Crimson Comets of Fallville High.” Barry (Allen) saves a pilot from a deathly crash, then sprints to a class reunion! There’s more than the usual tripe at this gathering though! 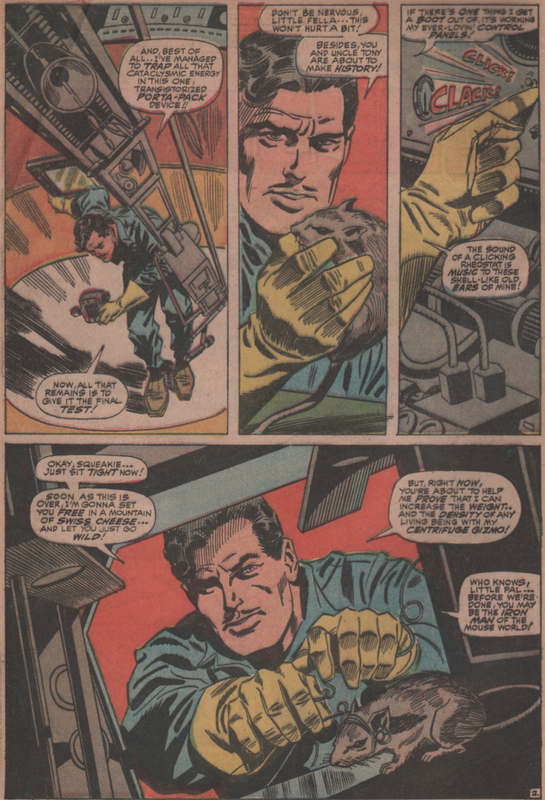 Writer Cary Bates, art by Irv Novick and Frank McLaughlin, letters by Gaspar Saladino, and colors by Gene D’Angelo. “Murder Haunts the Midway” is the second story, and involves a somber Deadman, as he recounts some of his past, then also must feel what it’s like to be inside the body of a suicidal man! 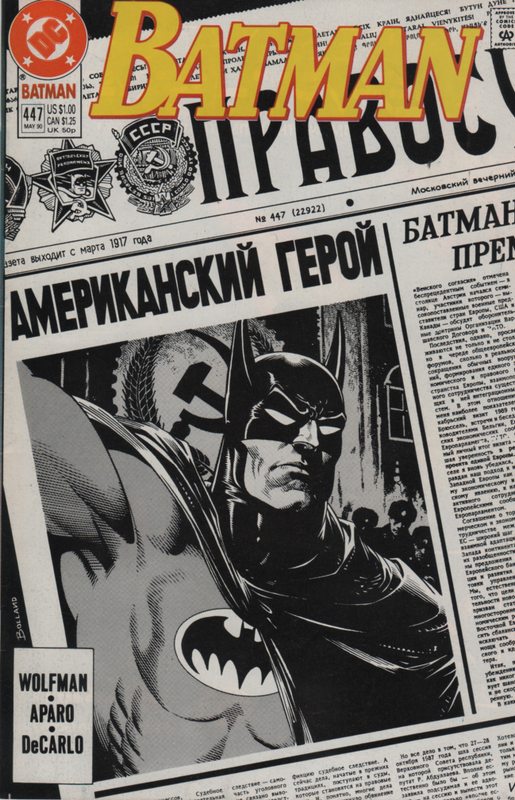 Oh and there are Commies, too. 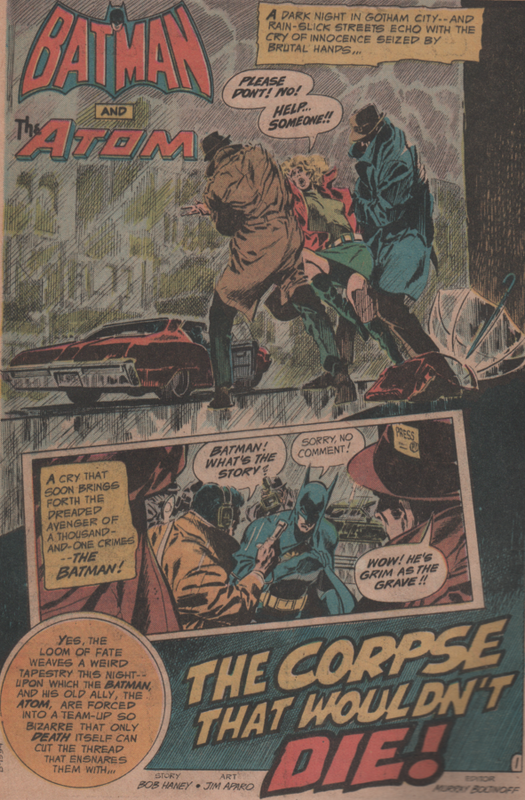 Writer Len Wein, art by Jim Aparo, and colors by Glynis Wein. 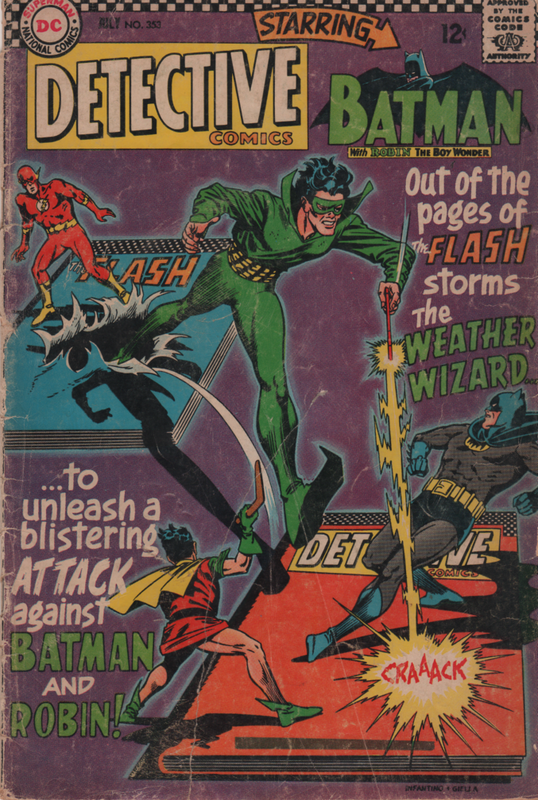 The third installment brings everybody’s favorite green guardian, Hal Jordan! 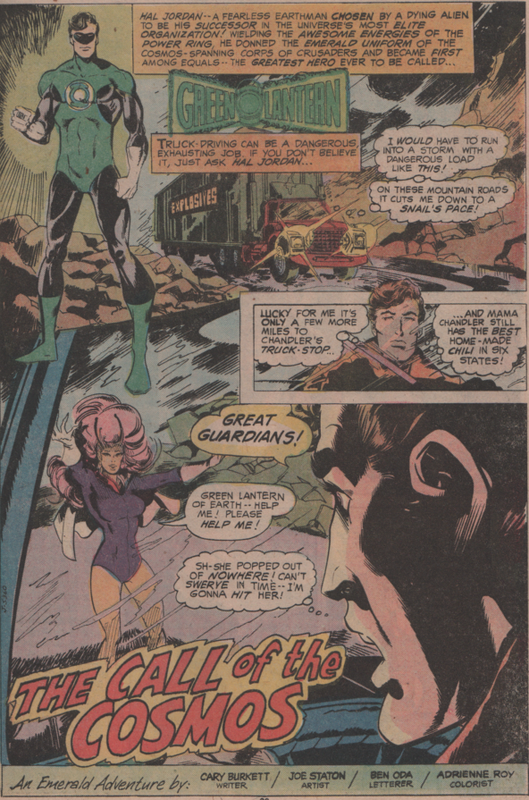 “The Call of the Cosmos” brings a hot, alien chick that needs Hal’s help. 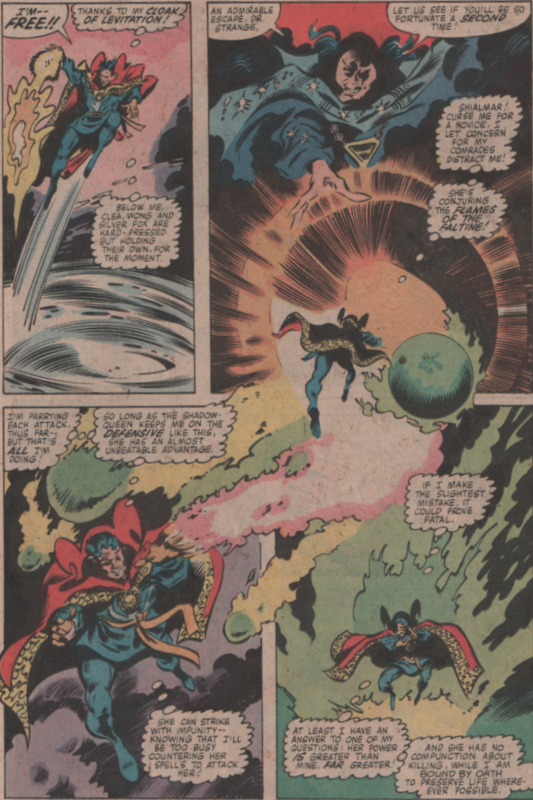 He flies around in space and blows stuff up like only Green Lantern can. Just a little action-packed story, nothing too heavy. 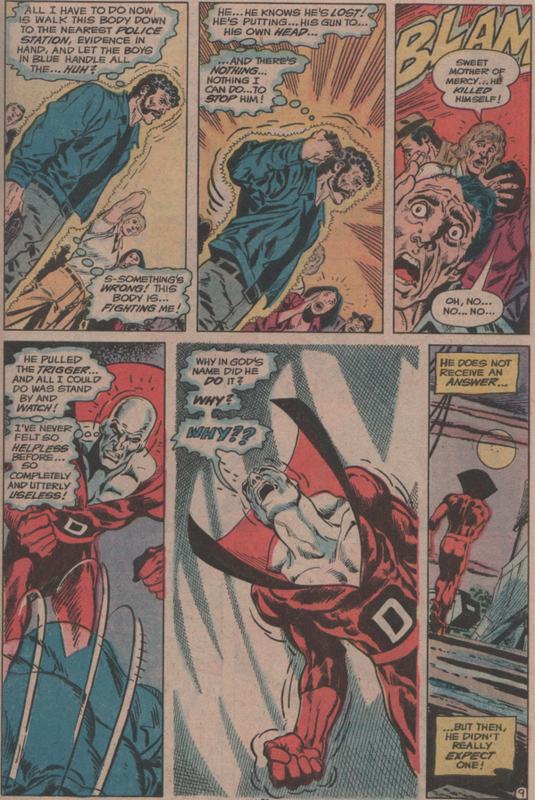 Writer Cary Burkett, art by Joe Staton, letters by Ben Oda, and colors by Adrienne Roy. 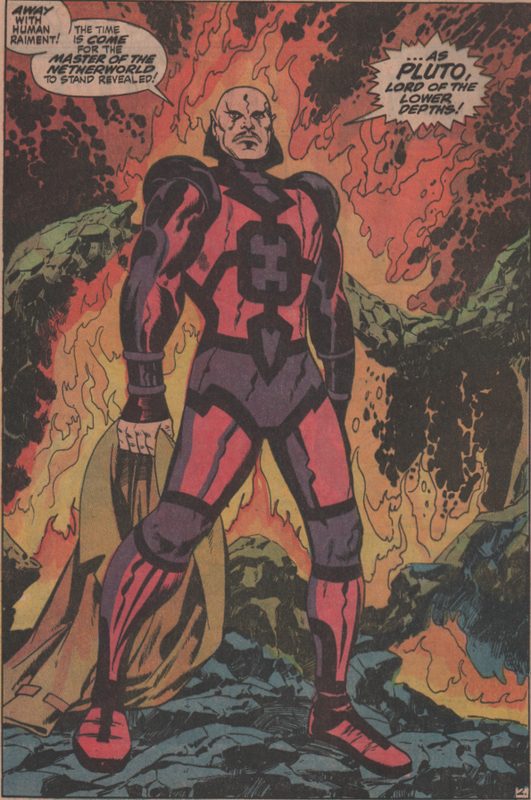 We next see “Orion of the New Gods.” A story involving all your usual suspects – Desaad, Forager, Metron, Lightray, and Jimmy Carter…? Neat story, and cool artwork, but it’s just pale in comparison to Jack ‘King’ Kirby’s work with these characters. 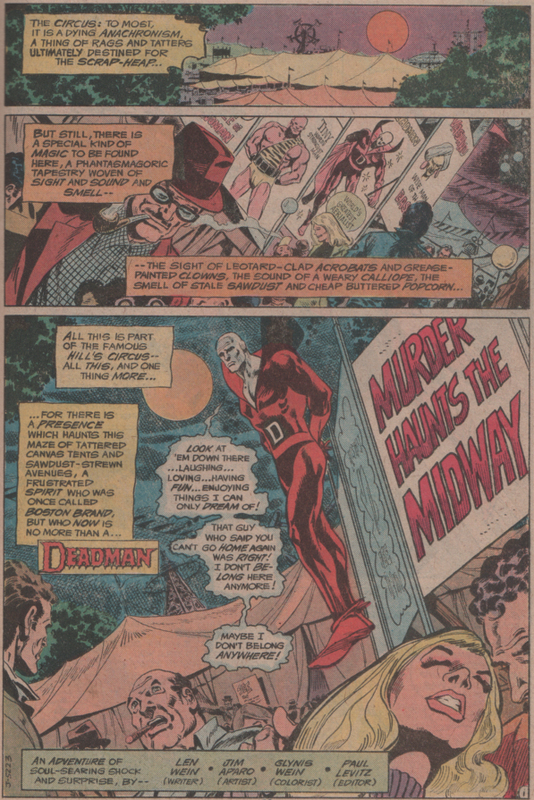 Writer Gerry Conway, art by Don Newton and Augie Scotto, letters by Ben Oda, and colors by Jerry Serpe. The Elongated Man is the star of “The Case of the Fortune Cookie Fortune” and this is the most absurd tale in the entire book. Not that it isn’t a fun romp, but it just doesn’t really feel like it fits with the rest of the stories. A fortune cookie has a one-thousand dollar bill inside of it instead of a fortune, and it’s up to Ralph to figure out what’s going on. 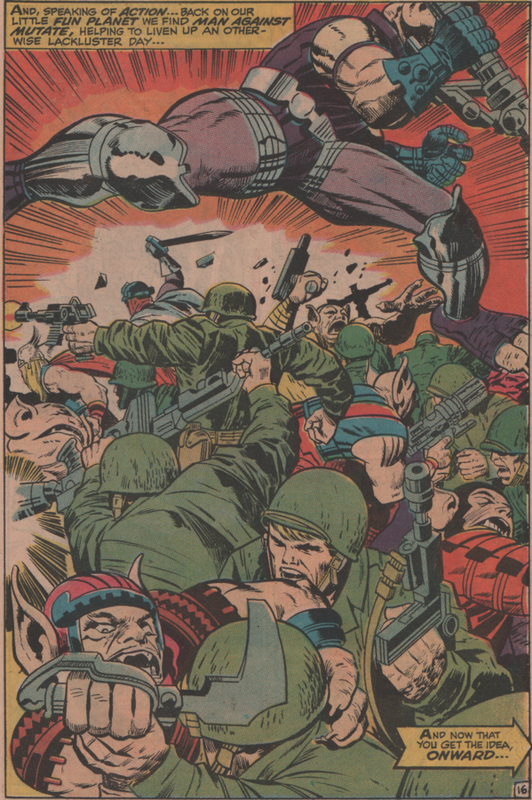 Written by Len Wein, Paul Levitz, Mike Gold, Ann Delary-Gold, and Steve Mitchell (not quite sure why they needed a small army to write this one), art by George Ruppert and Bruce Patterson, letters by Clem Robins, and colors by Glynis Wein. Lastly, we have Princess Diana of Themiscyra, Wonder Woman, battling the Shark! This is one is very bizarre as well, but keeps with the action theme nonetheless. 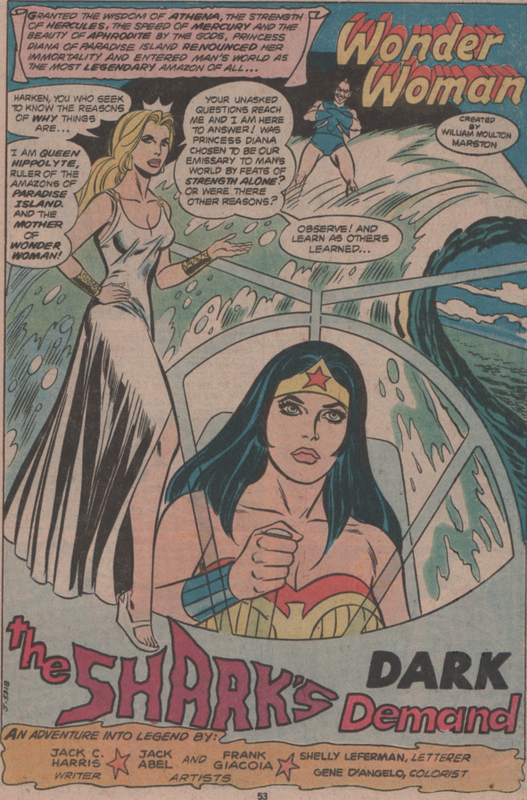 Diana fights the Shark, is defeated by him, then isn’t, then uses her magic lasso to turn him back into a shark. Yeah, um, this one is wild to say the least, including Hippolyte speaking Spanish. 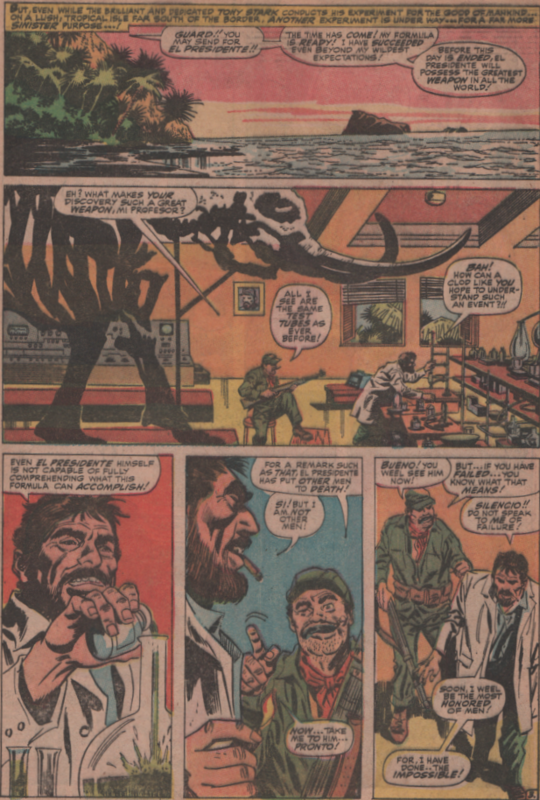 Writer Jack C. Harris, art by Jack Abel and Frank Giacoia, letters by Shelly Leferman, and colors by Gene D’Angelo. The magazine market was in full swing in the 1970s, but as the decade ended, a lot of them went down the toilet. 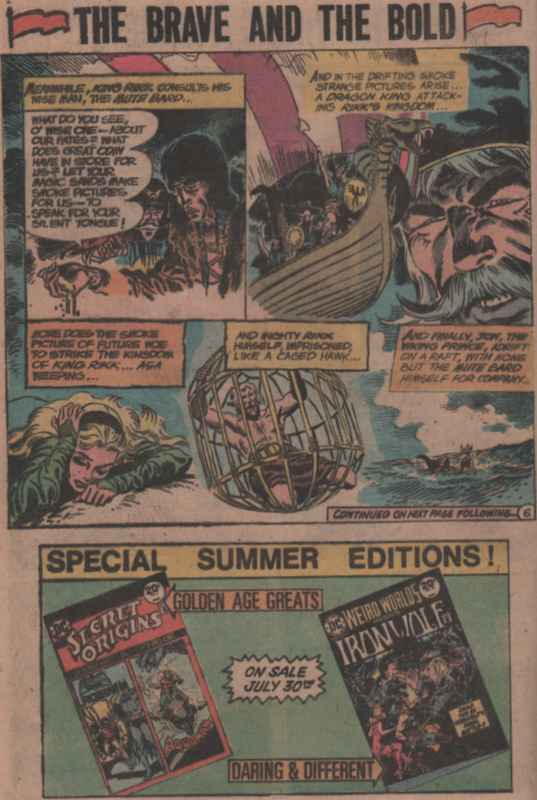 A few lasted into the 1980s, some changing names, like Marvel Preview changing to Bizarre Adventures! These mags were all over the place as far as content, from superheroes to science fiction, to film adaptations. 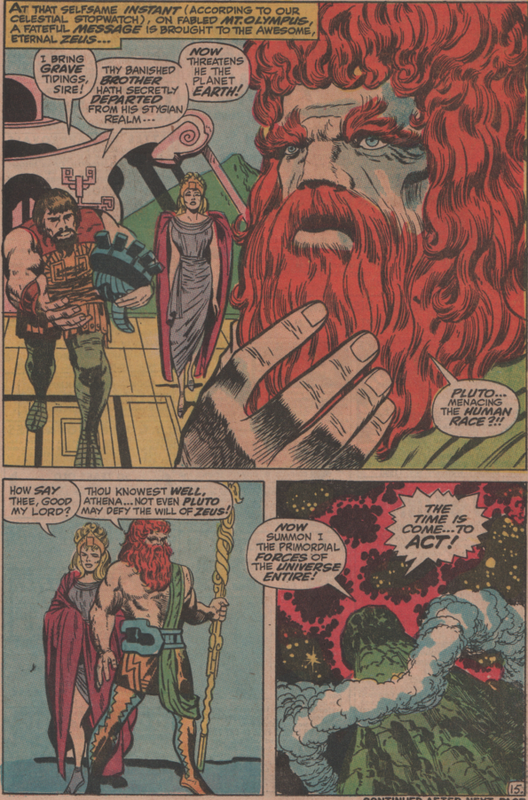 This particular issue focuses on deities, and the one being spotlighted here is none other than Thor Odinson! 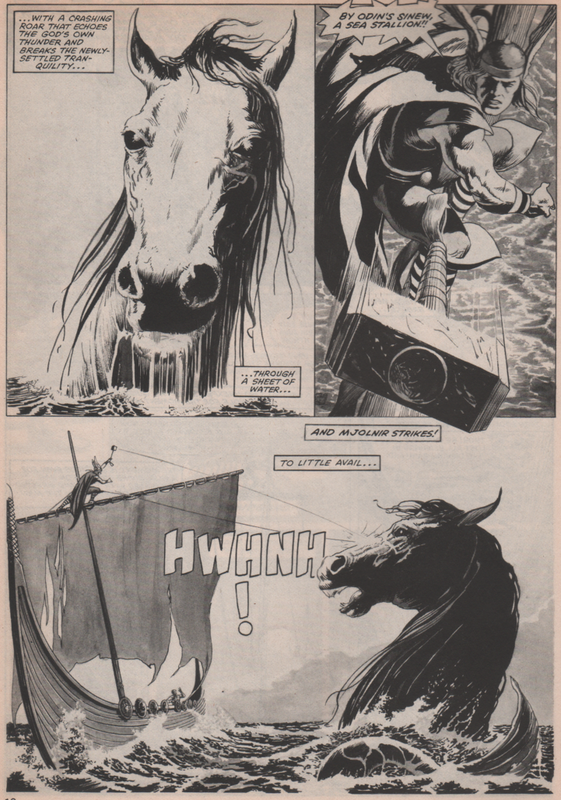 The story is definitely in the bizarre category (for all I know it has roots in the character’s mythology), as Thor must take a viking long ship to the sea and fight a giant horse…not kidding here. It’s not just a regular horse but one that has the lower half of an aquatic animal. 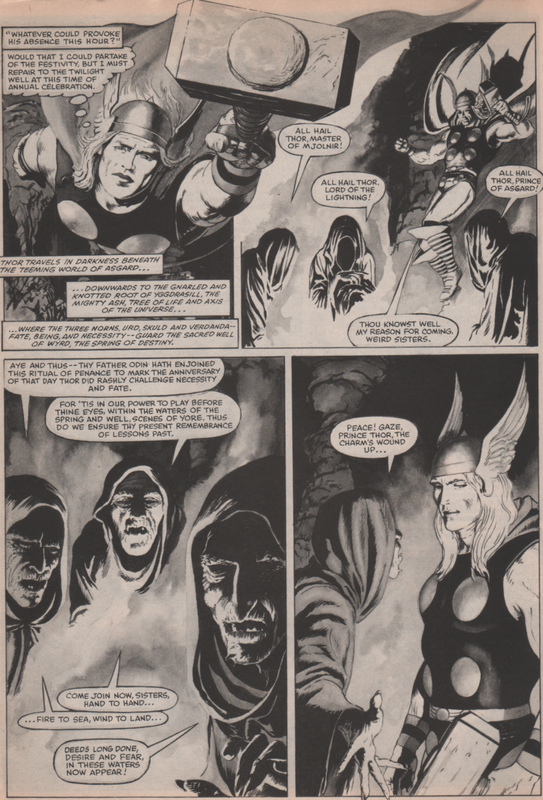 Guest appearances by The Warriors Three, Odin, and Heimdall! 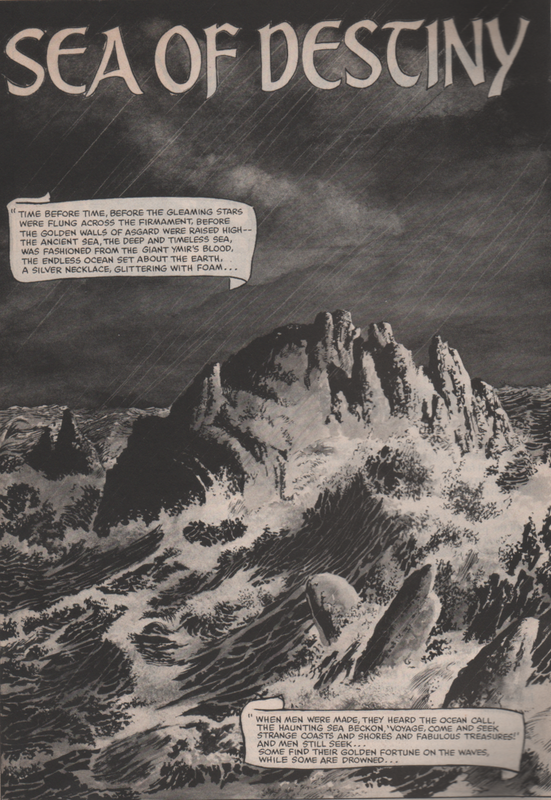 Written by Alan Zelenetz, with art by John Bolton, this story should’ve just been expanded to encompass the entire book. No offense to the other stories in the book, but none even come close to being as awesome as that one. The magnificent cover is by High School of Art and Design alum, Joe Jusko! 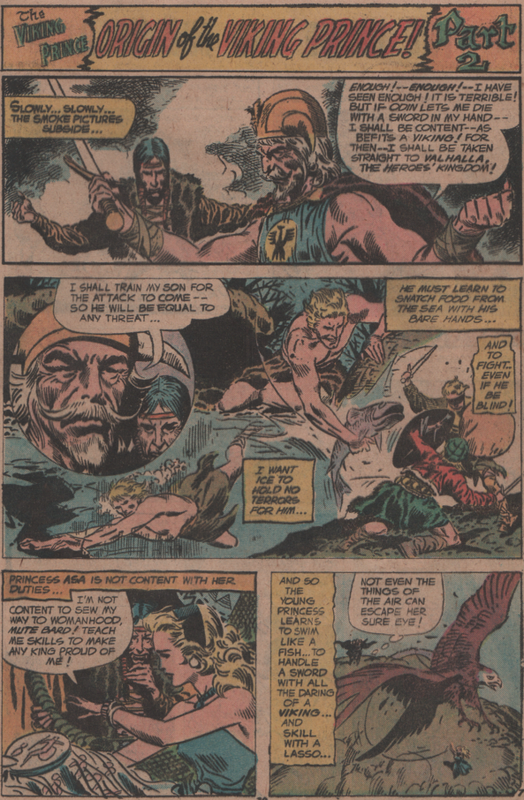 The DC 100 page comics from the Bronze Age are nothing short of gems. These multi-storied books bring a variety like no other to a reader, and they do it by simply providing extraordinary content. With one original story and four reprints, this book is an excellent representation of what made DC comics a great company. 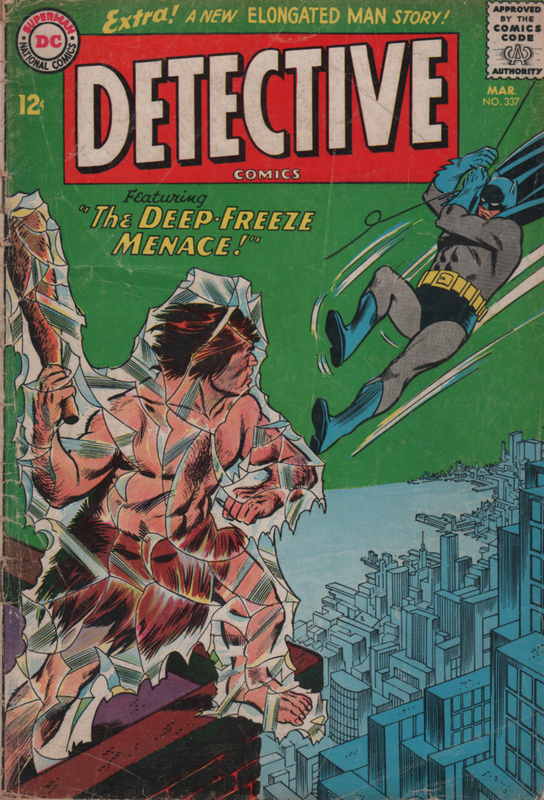 A new Batman story, straight from the mean streets of Gotham! We see Batman down for the count, as he’s nearly killed by some hoods! 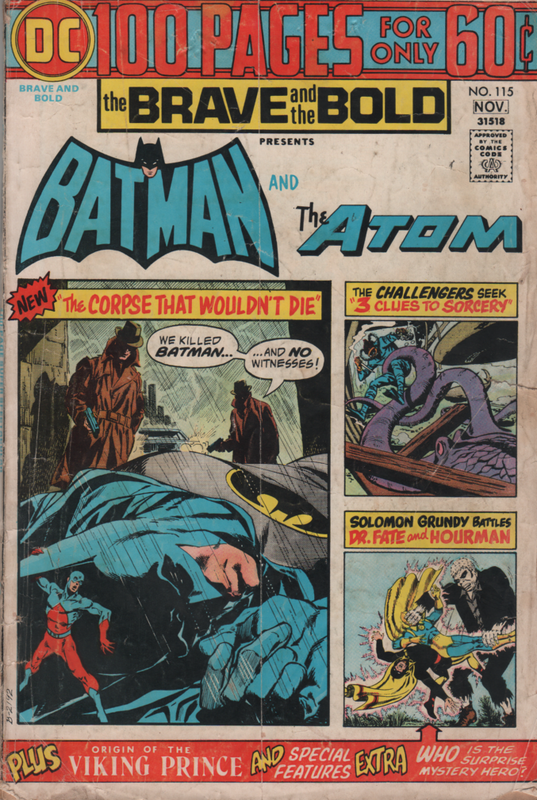 It’s up to the Atom and Commissioner Gordon to save the Dark Knight! 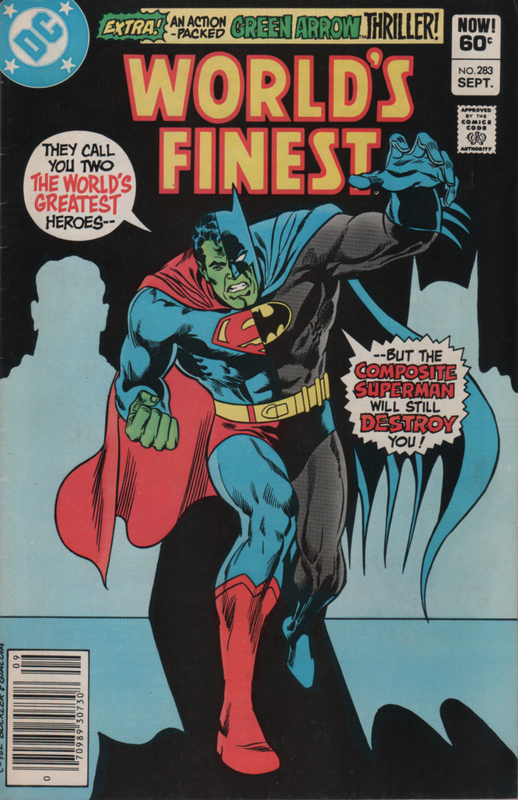 Written by Bob “Zany” Haney, with art by Jim Aparo! 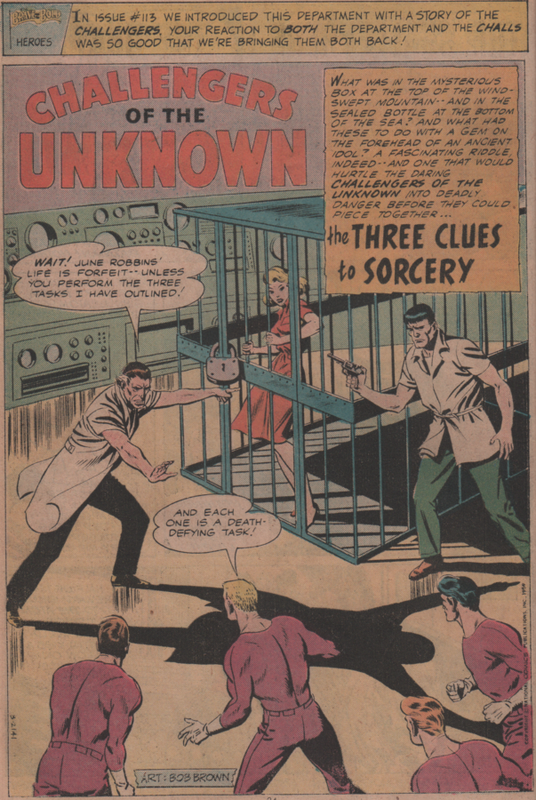 Next up is a reprint of Challengers of the Unknown (issue 12) with “Three Clues to Sorcery.” You get it all in this one – a gorilla, a gigantic squid, a mysterious gem, and more! 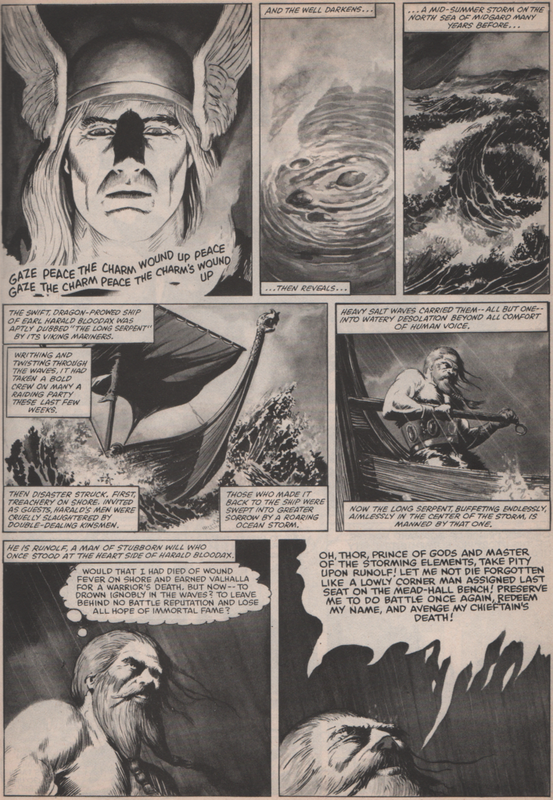 Written by Ed Herron (most likely), with art by Bob Brown. In the following reprint, we get a good one (and a personal favorite of mine)! “Solomon Grundy Goes on a Rampage!”, features just that, Grundy going ape and kicking the crap out of Dr. 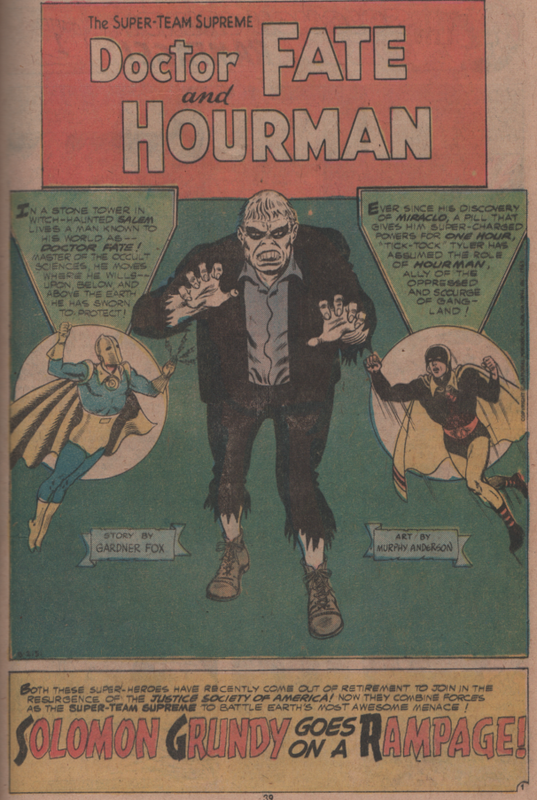 Fate, Green Lantern, and Hourman! 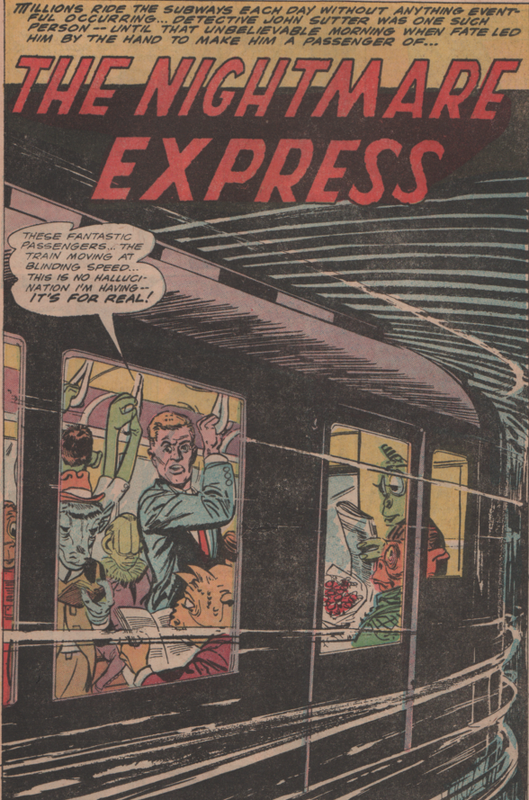 Written by Gardner Fox, with art by Murphy Anderson. 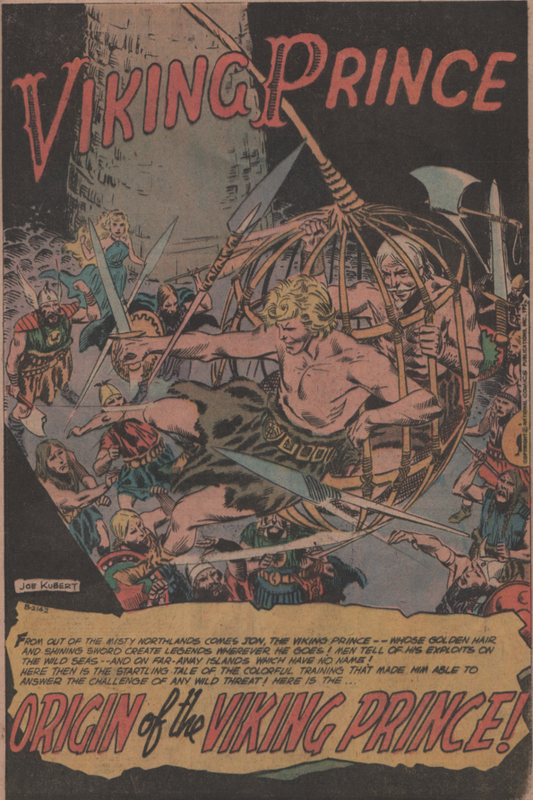 in the fourth installment, a legend in the comic book industry brings us one of his best illustrations with the “Origin of the Viking Prince!” Joe Kubert is the artist, and he delivers the goods. 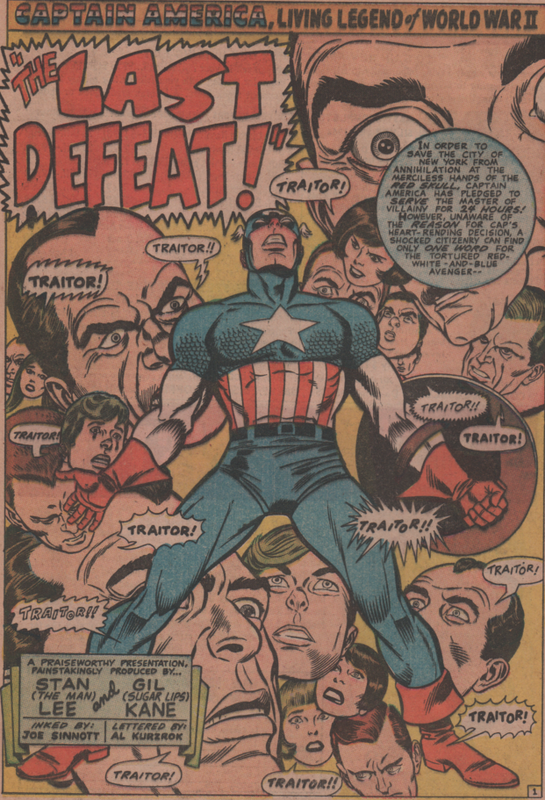 Script by Bob Haney. Lastly, we get another titan of the comic book industry (well three really), as Ray Palmer, A.K.A. 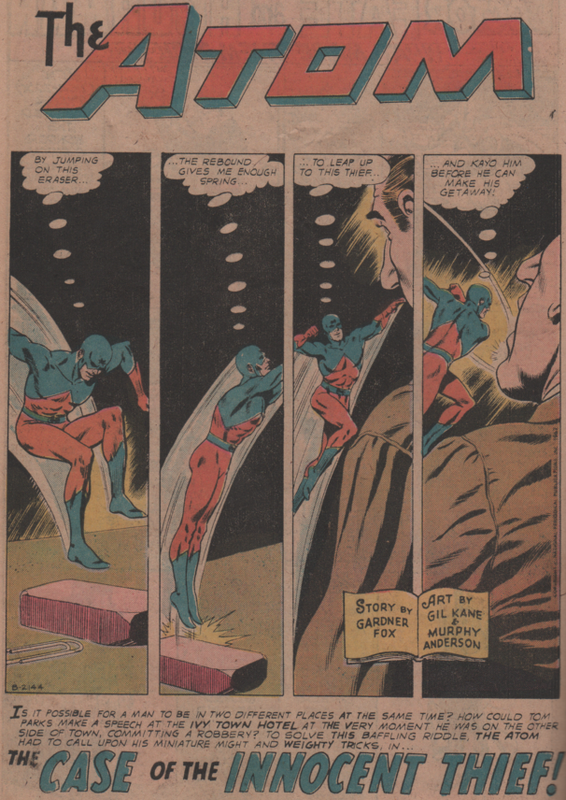 The Atom, is brought to us in “The Case of the Innocent Thief!” – by Gardner Fox (story), Gil Kane (pencils) and Murphy Anderson (inks)! 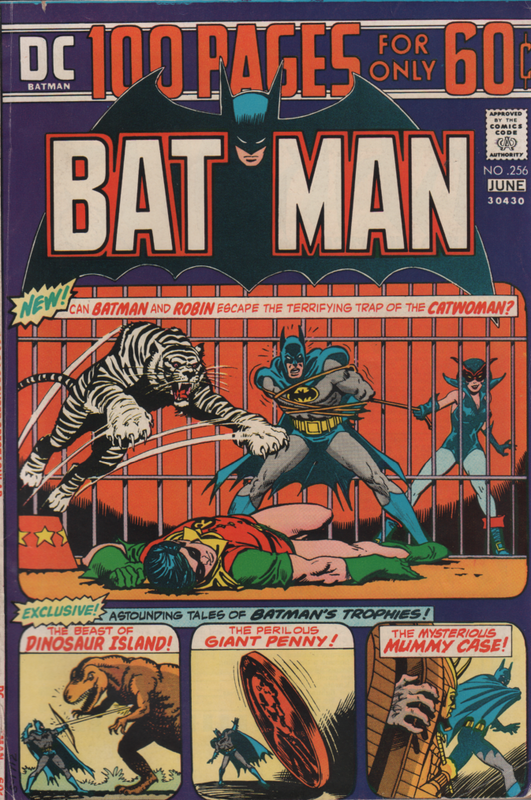 The cover features illustrations by Jim Aparo (Batman), Murphy Anderson (Grundy), and Bob Brown (Challengers). As this volume of Dr. 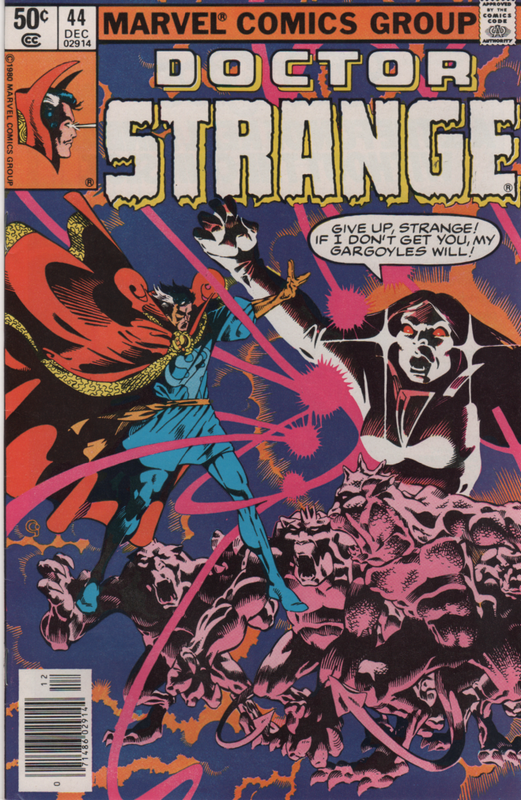 Strange rolled on, different creators were tasked with bringing a new vision to the title. From start to finish (the last few issues were a bit of a let down), this series is packed with creators that did good by the old Doc, and these issues are more proof of that fact. 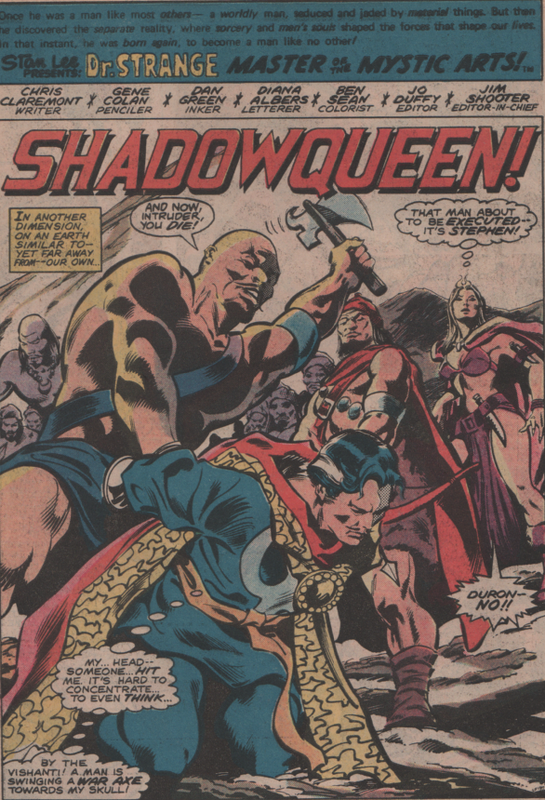 In the final pages of issue 42, we saw the Doc get attacked from behind by a muscle-bound guy wielding an axe, plus a group of bad-looking dudes and a mysterious woman. Upon further review, this woman is Clea! 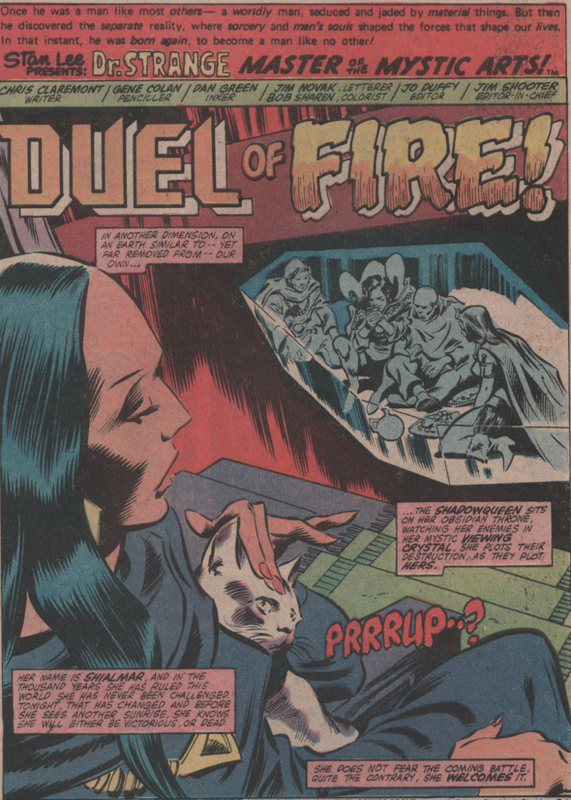 She instructs the man to let Strange go, and then introduces him to the rebels on this world (Clea went after Wong, who got lost in a previous issue). Well, luck would have it they find Wong, and then it’s up to the rebels, and the Doc and his crew to stop the wicked witch of the…er, I mean, the sorceress Shialmar! 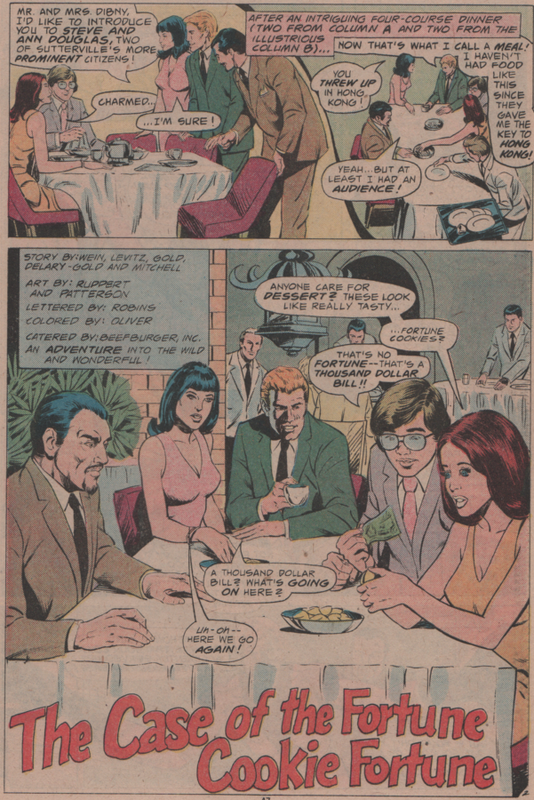 In the second issue, we get some back story involving Wong’s family history. A nice little touch considering he didn’t get much exposure aside from being the Doc’s right hand man. 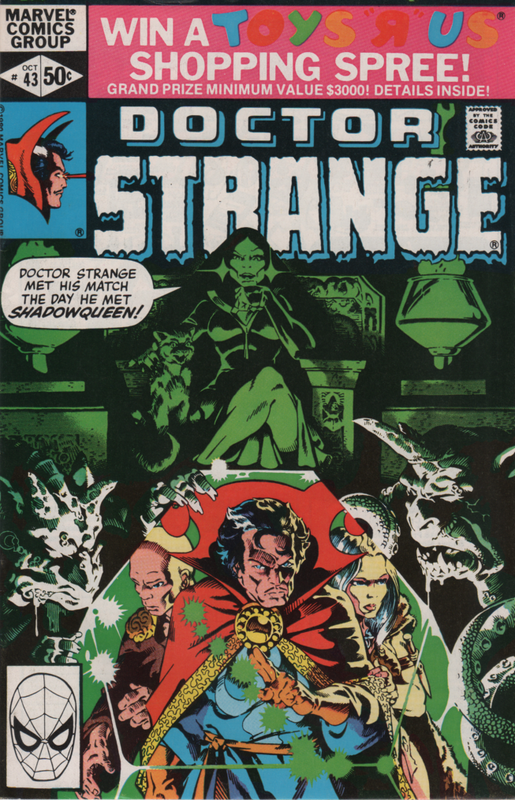 This particular run of Doctor Strange features some really good stories by Chris Claremont (writer). Of course he’s known mostly for his work on the X-Men, and rightly so, but if you’re a fan, don’t stop there because his work here (and Marvel Team-Up just to name one more) is very solid. 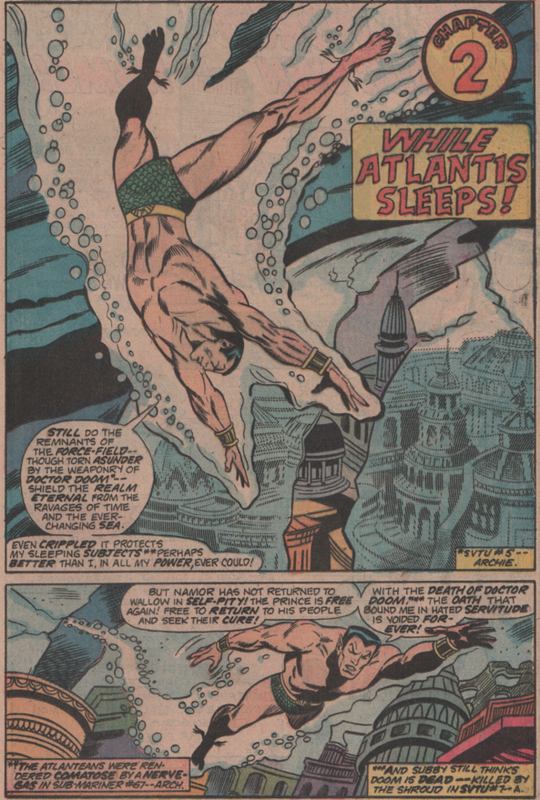 When you add the incredible art team of Gene Colan (pencils) and Dan Green (inks), with colors by Ben Sean and Bob Sharen, and letters by Diana Albers and Jim Novak (respectively), you get great Bronze Age comics! 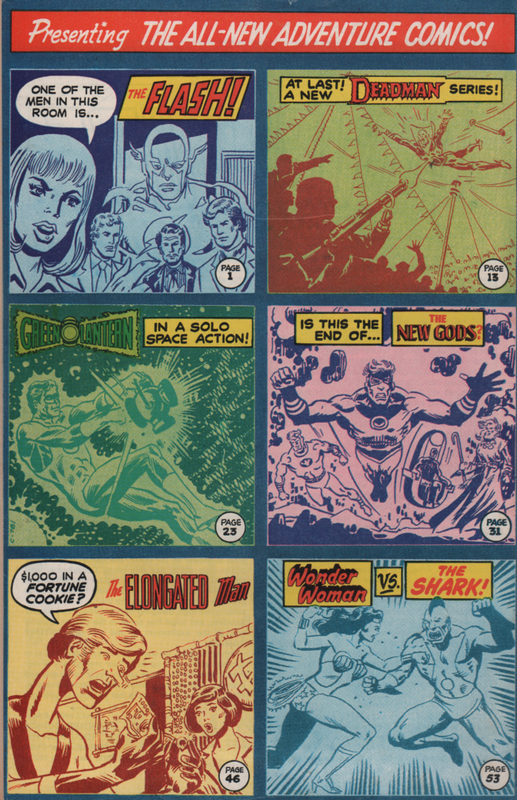 And if that wasn’t groovy enough, the two covers are by Michael Golden!